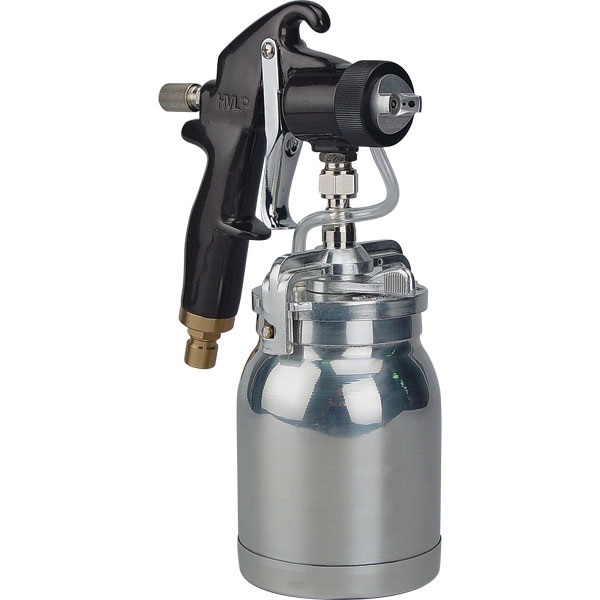 Years of HVLP painting experience, customer feedback, and hands-on testing have created an outstanding, and affordable, ProLine Turbine Spray Gun. This HVLP turbine gun is the same gun as used with our Showtime Series Turbine Systems and is the perfect choice for finish spraying or primering. GUN SPECIFICATIONS: 1-qt pressure-fed aluminum cup assembly keeps metallics suspended. Gun has stainless steel fluid needle and fluid nozzle for years of dependable service, powder coated casting, adjustable spray from the size of a dime up to a 13" pattern, and aluminum air cap for fast, easy cleaning. Bleeder style (air blows through the gun when air valve is open). Developed by TP Tools especially for HVLP spraying. 4-1/4" wide, 11-3/4" high, 7-1/4" deep. For use with Showtime Series HVLP Turbine Systems and most other turbine systems. Will not work off an air compressor. Have you ever sprayed candy colors and they turned out like a spray can? With this gun anyone with any common sense can do it blindfolded! I recommend this item. Produces phenomenal results. Just recently started using the turbine system, there's a bit of a learning curve from conventional automotive refinishing but well worth the time, aside from reducing material costs over spray is minimal and dry times are reduced as well.